Relax after a long day's work in the comfort of the 2 Piece Brown Bonded Leather Reclining Chair With Ottoman by Cambridge Home. This recliner and ottoman set has a stylish, contemporary look thanks to its clean lines and dark brown bonded leather upholstery. The tension knob on the base of the recliner allows you to control the reclining position for maximum comfort. Relax after a long day's work in the comfort of the 2 Piece Brown Bonded Leather Reclining Chair With Ottoman by Cambridge Home. 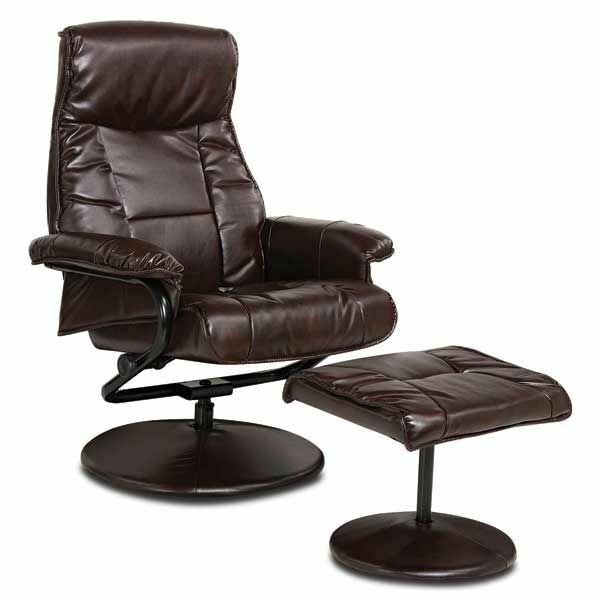 2 Piece Brown Bonded Leather Reclining Chair With Ottoman from Cambridge Home. Covered in brown bonded leather. Turn tension knob to control reclining position.